Every so often, something cranks up the heat on Chinese hatred for Japan. In the mid-2000s, it was Japanese textbooks glossing over the Nanjing Massacre; the Japanese prime minister’s annual visit to the Yasukuni Shrine never fails to rankle mainlanders. To many Chinese nationalists, World War II is still a fresh wound. The ongoing dispute over the Diaoyu Islands, known as the Senkaku in Japanese, also feeds the flames. Uninhabited and without any known natural resources, the Diaoyu controversy is nonetheless a cause célèbre. 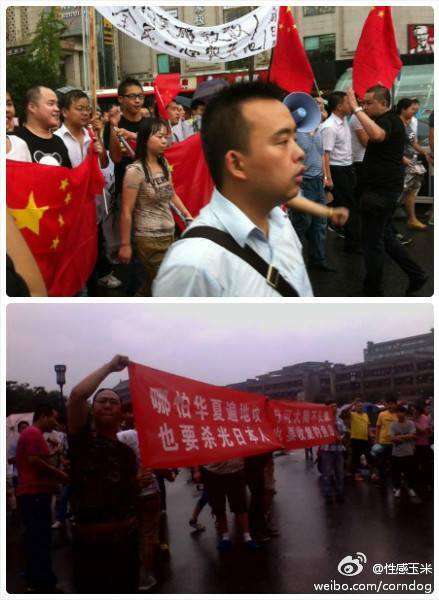 Two weeks ago, Japan arrested Hong Kong activists on Diaoyu, leading to protests in China. The Tokyo governor’s calls to purchase the islands have further stoked tensions. On Monday, the Japanese ambassador’s car was attacked in Beijing. The novelist Wang Shuo has harsh words for the protesters on Weibo, saying “The same kind of people who are called fascists in Japan and Nazis in Germany are called patriots in China” (有这么一群人，在日本叫法西斯，在德国叫纳粹，在中国叫爱国者). Read more about the online reaction to the anti-Japan protests from CDT. Via SneezeBloid. Thanks to @dujuan99 for translating the Wang Shuo post.